The Killers are thrilled to announce their return to Australia and New Zealand in April and May 2018. The widely-acclaimed rock band will play seven arena shows on their biggest Australasian tour to date, touring in celebration of their fifth studio album Wonderful Wonderful, out Friday 22nd September. 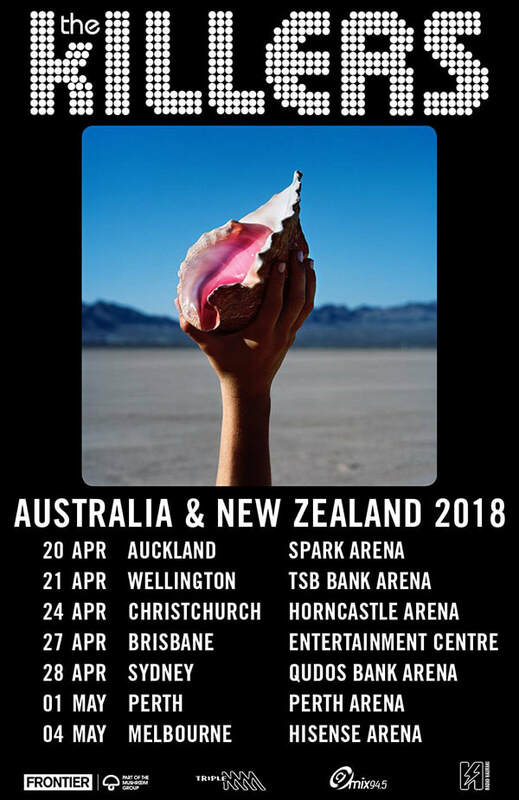 Kicking off in New Zealand at Auckland’s Spark Arena on Friday 20 April, the band will visit Wellington and Christchurch before heading to Australia to perform in Brisbane, Sydney and Perth, before wrapping up the tour at Melbourne’s Hisense Arena on Friday 4th May. The Killers burst onto the scene in 2004, topping Australian charts and going Double Platinum with their debut album Hot Fuss. Featuring hit singles Mr. Brightside and Somebody Told Me, the album received instant popularity and widespread international success. Their early success continued with two further platinum albums Sam’s Town (2006) and Day & Age (2008), smash singles like When You Were Young, Human and Read My Mind, and a touring schedule featuring headline arena shows and festival slots around the world including Glastonbury, Coachella and Lollapalooza. Teased by a series of incredible new songs - The Man, Run for Cover, Some Kind Of Love and title track Wonderful Wonderful - the album is the band’s most sonically forward-thinking record yet, bursting with all of the blazing choruses and arena-pleasing anthems that make them one of the world’s biggest and beloved rock bands. Back in Australia towards the end of the month, The Killers will be performing in the Virgin Australia Pre-Game Show and Virgin Australia Premiership Party on the 2017 Toyota AFL Grand Final Day (Saturday 30th September). Guaranteed to provide audiences with an outstanding live show, the performance will be a precursor to the incredible tour set to hit our shores next year. Frontier members’ tickets on sale Wednesday 27th September until Thursday 28th September. Pre-sale timings staggered per show, visit website for more details.